It’s hard to gather my thoughts about such a vast and majestic wilderness. Standing among mountains that reach the stars and trees that touch the clouds just gives you a feeling. Not too many thoughts while standing there at first. Just…feelings? I don’t know. It’s extremly hard to capture the insane beauty of this place in anything. Words, photos, video..nothing does it justice. I truly think it’s one of the most beautiful places on earth. Our first evening at the park we just set up camp and went to a ranger program where Ranger Mike talked about Louis and Clark and their brave and challenging treck across the unknown west. It was an interesting evening that ended with cooking hot ham and cheese over the fire. The next morning we awoke early and headed for the hills…or mountains rather. 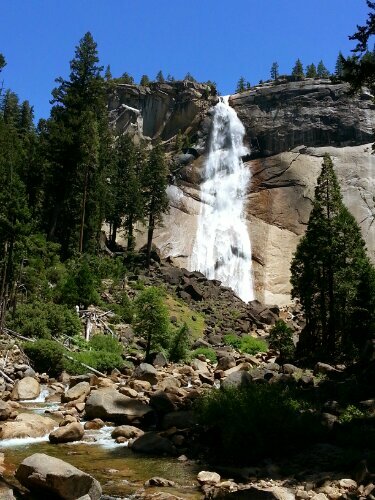 We were told to hike Vernal and Nevada falls, two waterfalls that are perched consecutively along a river in the park. Excited, we hit the trail. The hike took about 6 hours and was worth every drop of sweat. After hiking maybe a mile and a half or so, we reached the first of the two waterfalls, Vernal, which seemed to be about 500 feet tall. It was beautiful. After admiring it from a short distance we began the climb up and eventually landed at the top which was a beautiful area filled with pine trees and giant boulders. The river found its way around all the boulders and created somewhat of a pond where we stopped to cool off. 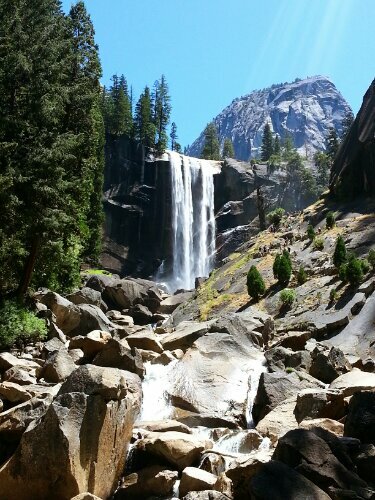 After our short break we pushed onward for Nevada falls which is a much steeper, taller and challenging climb. Although the hike was dificult and involved very little drinking water, we made it to the top! It was beyond rewarding and so worth it. The view is indescribable. After enjoying our time at the top we hurried down to the car to drive about an hour to a very historic and veautiful place in the park called Glacier Point. 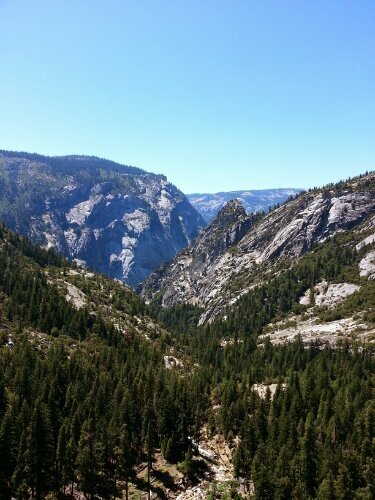 The point overlooks the famous Half Dome and the whole Yosemite Valley. While up there we attended a fantastic Ranger Program with Ranger Dave. He spoke of the history of Glacier Point and the important roll it played in the parks history. It was super super cool. I need to go on record and say Ranger Dave is an AWESOME guy. He is hands down our favorite peraon we have met on this trip. He is super educated, informative, friendly and truly cares about his job. Check out his blog, he featured us! Read here! After the ranger program we hung out up there to watch the stars. Let me tell you… it was beyond worth it. 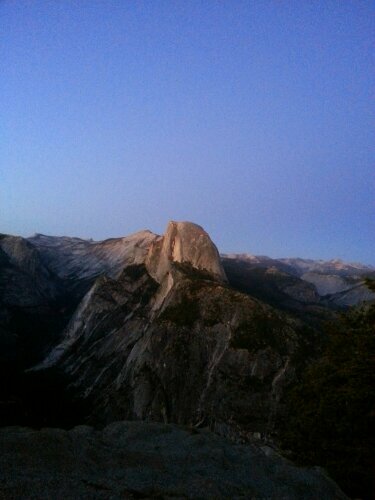 We were lucky enough to see a very large/long shooting star right over half dome! 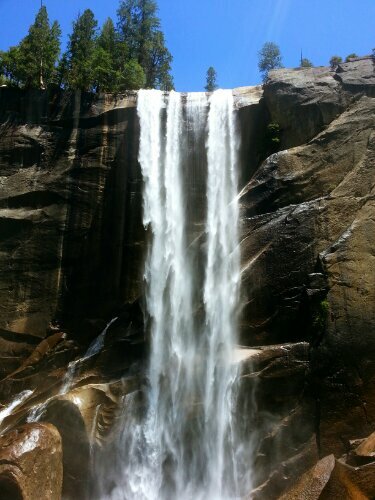 It was the perdect ending to our eventful time in the beautiful Yosemite.